When we were in Austin for SxSW this year, allergy we followed someone’s recommendation to get some tacos at Torchy’s. I can’t remember where I read about it or who recommended it, mind but I wish I could thank them. The tacos were fresh and inventive and your tacos are cooked to order in an old van. You can also order a bucket of beers from the bar next door. Too bad I had a raging hangover from too many free Phizz-tinis the night before. (Don’t ask.) I had a seared tuna taco and shredded pork one. We ate them at a tiny metal garden table as the sun set. It was a perfect last meal in Austin. Since my husband is addicted to all manner of Mexican food, I make tacos regularly and have started branching out from the traditional meat with onions, cilantro and lime juice. Last night, I broiled a couple of salmon filets simply with salt and pepper. Then I topped them off with a salad of yellow onion, radicchio, yellow carrots, cilantro, lemon & lime. They were really light and refreshing. Perfect for a sunset and a beer. Too bad all we had was seltzer and the TV. Preheat the broiler and line a cookie sheet with foil. Lightly grease the foil, place the salmon filets on it and lightly sprinkle with salt and pepper. Broil the salmon for 6 – 10 minutes, depending on the thickness of the filets. You definitely don’t want to cook too long or they’ll be too dry. They’re ready when the meat flakes easily, but is still moist inside. Once they’re ready, remove from the oven and shred the meat using 2 forks. While the salmon is cooking, prepare the salad. Add the radicchio, onion, carrot matchsticks, serrano peppers, sugar, cilantro, lemon and lime to a big bowl. Stir together and adjust the seasoning as needed. Heat the tortillas by placing them in a pan, putting them in the already hot oven or microwaving them in a paper towel until they’re warm and steamy. This should take more than a minute or two. You don’t want them to crisp up or dry out. 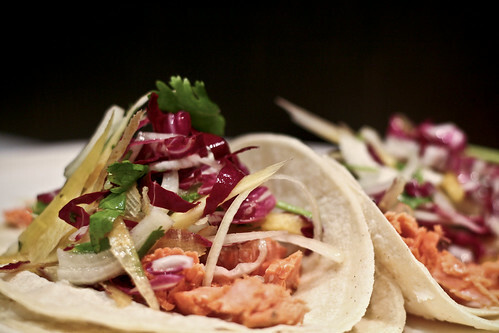 Assemble the tacos by layering the tortillas 2 thick, then adding some salmon and a big heap of salad. Enjoy with beer (sunset optional).